According to Moore’s Law, the number of transistors per square inch doubles every eighteen months. Because of this, computers and consumer electronics have become smaller, more powerful, and more accessible than ever before.This known phenomenon has implications across multiple aspects of electronic components including reducing their weight while improving their strength and decreasing their size. We have a unique capability, due to our Swiss-style CNC lathes, to produce components with dimensions and tolerances not possible on standard CNC lathes, using a broad range of materials. Our machines are capable of producing parts with tolerances of ±0.0001in, which is important when producing effective electronic components. When producing electronic components, large production volumes of small components is common. When fractions of a cent per item can affect profit margins, our customers are confident products will be manufactured at a competitive cost and in the volumes required. With our precision electronic parts machining have the capability to produce not only single-item rapid prototypes but also up to 100,000 items per order. With our low lead time of 2-8 weeks, our customers are never caught waiting on production and are pleased knowing their items will be delivered on time, every time. 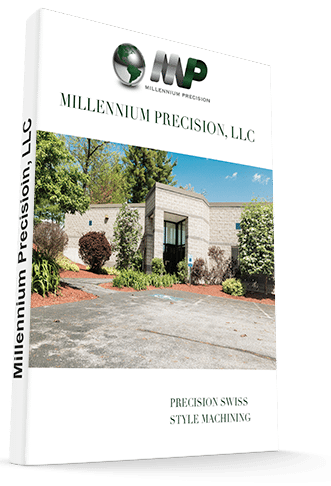 As a precision electronic component manufacturer, whether your company requires a part that is fractions of an inch or yards long, metal or plastic, and in large quantities or single-item prototypes, Millennium Precision can provide a solution to your unique electronics problem. Our manufacturing process maintains ISO 9001:2015 certification, which displays our commitment to strict quality control standards no matter the size of your part. When fractions of a thousandth of an inch count, customers trust us to thoroughly inspect each lot to ensure every item meets the requirement of the customer.